Okay, I don't want to be seen as a piker here. 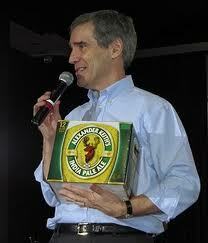 Yesterday I was begging for Mr. Ignatieff to stand up for something and, oddly enough, today he did! Now it's a long laundry list of things he decided to stand up for so there's a danger that it may all get lost in the miasma of media translations and therein lies the problem he must solve if he is ever to govern. It's not enough to stand up for principles -- it's a great place to start and all -- but you have to make them heard! Witness how the churlish John Ibbitson of The Globe and Mail reports on Iggy's policy speech. He seems to say that Iggy shouldn't be holding these positions because some of the policies he's repudiating are those of previous Liberal governments. So advocating for these principles he believes in and are, for the most part, supported by the majority of Canadians is not only untenable but it is going backwards in time. Seriously, that's his argument. So let's have a peek at the list Mr. Ignatieff is advocating for: There's a call for renewed commitment to peacekeeping operations, a campaign to ban cluster bombs, renewing Canada’s commitment to limit global warming to within 2 degrees C, increasing the number of African countries receiving aid, and increasing the emphasis on diplomacy and development, rather than concentrating primarily on defence. Issues the majority of Canadians (non-Conservative voters that is) are likely in agreement on. To John Ibbitson though, this means it's 1999 all over again. Well, I'm not convinced that's a bad thing for Canada or for Iggy. The Liberals were popular and in power in 1999 so let's hope that that this kind of talk doesn't dissuade Mr. Ignatieff from these policy positions. More importantly though, Michael Ignatieff needs to follow through with part II of standing up for something and that is making sure it is heard! Iggy has to get up every day and repeat them until the press has no choice but to report what it is he is standing up for. And his fellow MP's repeat the exact same messages day in and day out until it breaks through into the consciousness of Canadians. Then maybe, just maybe, he'll stand a chance against the always on message Conservative machine that has undercut him at every turn. It might also help if he paid less attention to the polls. Unfortunately, polls and mainstream media which is Harper friendly for the most part these days, and hacks like Ibbitson are all these politicians of any party have to work with. Iggy's policies you mention are all good ideas, something most progressives can go for, but the problem is Jane and Joe Six Pack at Timmy Horton's can't get behind any of it. Jane and Joe represent the majority center, which has been shifting to the right; as unpleasant as that may be for us, it isn't practical to ignore. jane and Joe don't care about Foreign Policy, period. They only care about what's going on in their own backyard. Again, Iggy is going with the complicated language, when dumbing down is in vogue. Rob Ford proved this, so have the Rethuglicans south of the border yesterday. Iggy is going to have to play that same anger and monosyllabic game of dumbing down. He's gotta find something that sells. Health care would be definitely one. Especially since the feds have been talking ending the health transfers in 2014. With the aging baby boomers, increasing nay sayers and no doubt, heavy lobbying from the private for profit pushing Americanized health care in Canada, along with polls indicating that health care is the number 1 concern among Canadians. Iggy has already spoken of implementing a family home care plan. He needs to run with that and expand on health care.